Tracklist: Raoul Grivalliers and group: Abraham Soulagé Mwen; Bélia Manmay-La; Woulé Mako; O-Mérilo; Etienne; Léonar-O Plan-O; La Rivyé Léza. Augustin Gourpil and group: Manman Ma Grèv Baré Mwen; Au Nouvoté Rivé; Lanso. Raoul Grivalliers, Augustin Gourpil and group: Carmélite; Oh, Madiana. Malcousu Florius and group: Conte Guadaloupéen; Makak et Chyen. Malcousu Florius: Jean Mano di “Bouwo Dèhyè-Mwen Alé.” Bernard Karaman, Francius Laurence and Paulimy Laurence: Ti-Anne; Man Ti Sonson Averina. Loulou Boislaville and orchestra: Ti Paul. Hurard Coppet and orchestra: Bertina; Hommage à Ma Mère; Manzé Marie. Historically, it is the urban popular music of the French Antilles that has had modest exposure outside its native islands of Guadaloupe and Martinique. The sinuous clarinet lines of the biguine orchestras were popular in Paris between the wars, with Stélio et Son Orchestre Antillais perhaps the most celebrated, and in more recent years the record industry’s search for product for the ‘world music’ market has given some exposure to the zouk of bands like Les Aiglons, Kassav and Malavoi. The notes to this collection of 1962 recordings from Martinique make it clear that the biguine and mazouk traditions were displaced during the sixties and seventies by Haitian konpa and Dominican cadence (which seems to have a strong influence on zouk still.) As for the older, rural music, instrumentally dominated by percussion, and integrated with communal patterns of work, recreation and funerals, they disappeared as capital, mostly controlled by bèkès (whites), was switched out of agriculture into tourism, construction and banking, thus precipitating a mass migration of rural people to the cities and metropolitan France to find work. There has been a grassroots revival of folk music in Martinique since the early 1980s, and particularly of rural forms, but very few recordings of traditional music are available. This, and the ready availability of biguine and mazouk on other CDs, explains why the present disc concentrates on rural styles, and includes only four titles (the last above) from Alan Lomax’s recordings of urban music from Fort-de-France. No such problems of accessibility attend the drum-accompanied work songs; as this clip shows, they are extremely hot and exciting music, so much so, indeed, that they represent something of a puzzle. (sound clip) The purpose of work songs, as is well known, is to synchronise effort, thus making the task easier, both in terms of the energy expended and by fostering a sense of group solidarity. ‘As we pull, singing helps us, it makes us happy, we can go faster,’ as lead singer Augustin Gourpil explained. But if what’s required for hauling logs and boats is ‘a long pull and a strong pull,’ the rhythm here is surely not being given to the workers by the frenetic sound of the tanbou bèlè and ti bwa. I’m forced to conclude that the work rhythm is in the song - that it is, indeed, a work song - and that the drummers are supplying something else. Is it entertainment for the labourers, or the invocation of spirits, or what? All the music from Sainte-Marie is obviously strongly African in form and content, the French language aside. The other music Lomax documented has more obvious European elements, although it is, of course, still distinctively Martinican music. The haute taille (high waist) quadrilles of the mid-Atlantic region were considered prestigious because of their strong European influences, but at the same time they offered parodies of polite society; ‘for example, in one movement, partners stand close together but barely touch, gaze past each other disinterestedly [sic - uninterestedly is obviously meant], and tap their toes impatiently.’ Haute taille has not been revived in the 1990s, only one group being still active by the middle of the decade, perhaps because Eurocentricity no longer confers the same degree of prestige. The accompaniment was provided by small bands of strings, accordion and percussion, although the band Lomax recorded consisted only of accordion, tanbou dibas (Basque or bass drum - nobody knows which for certain) and maracas. There is figure calling by the drummer, obviously derived from Europe, like North American square dance calls, but interestingly, the drummer also uses his instrument to direct and energise the dancers, rather than playing a steady groove. The groove is supplied by the accordion and maracas, and I think I can detect, even at this early date, some influence from Dominican cadence in the fast and flashy playing of the former instrument. (sound clip) Ti-Anne, from which the clip comes, is the tune for L’été, one of five quadrille figures, danced either second or fourth, depending on whether the dancers are from north or south of the town of Le François. The complete track lasts for over seven minutes, which makes one wonder at the stamina required to dance a full set. 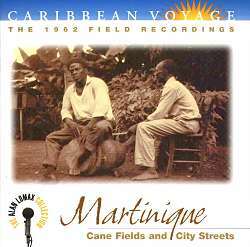 As I’ve indicated, there are one or two moments on this disc where the music is, for an outsider, more easily recognised as important than enjoyed as entertainment, but the great majority of it is very exciting listening, as well as valuable documentation of the variety of Martinique’s musical culture. This is a very well selected overview, first by Alan Lomax, a man who really knew how to make efficient use of limited time and local knowledge and then, forty years later, by compilers Julian Gerstin and Dominique Cyrille, who have done a splendid job of selection and annotation. Yet another landmark CD in the ‘Caribbean Journey’ sector of Rounder’s Lomax series.